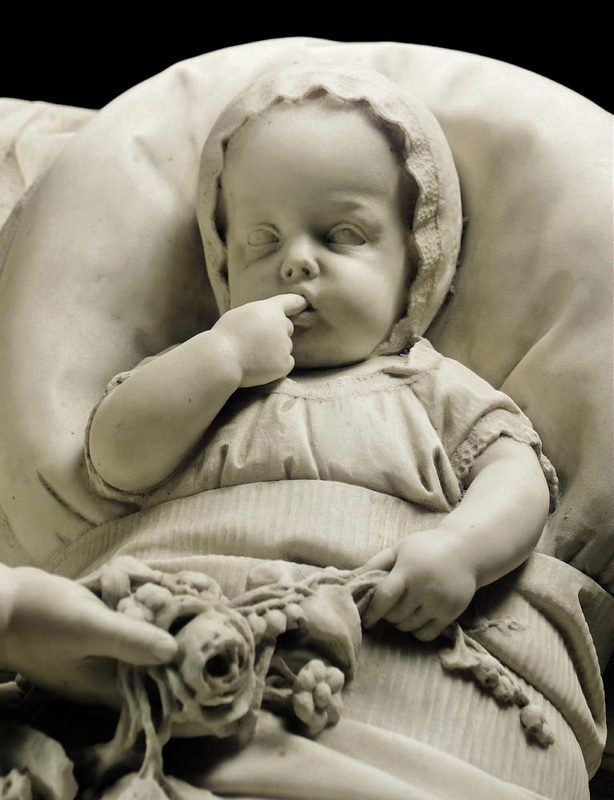 ANTONIO TANTARDINI (Italian, 1829-1879) An Extraordinary Italian Marble Sculpture of "A Young Child and a baby in a wicker crib" - A Risorgimento Allegory. 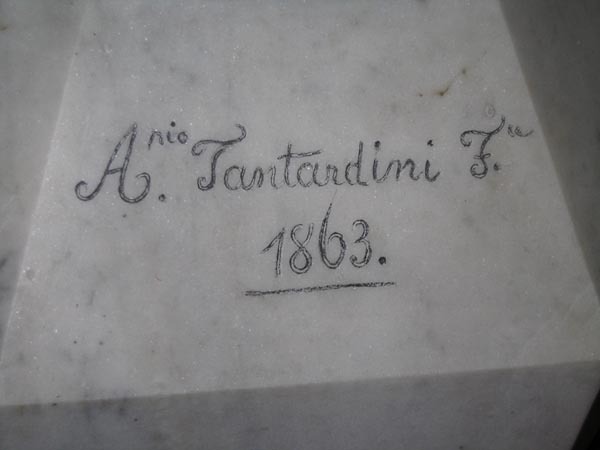 Signed & dated: A.nio Tantanrdini F.ce / 1863. The older child's medallion inscribed with an interlocked XV and GARIBALDI, the crib monogrammed: AR. Circa: Florence, 1863. This sculpture includes a recent custom-made veined black marble pedstal stand. In a country famed for its skilled carvers and working in an age when virtuoso carving technique was highly prized, Antonio Tantardini was one of the very best exponents of master carvers in nineteenth century Italy. Vicario describes Tantardini's skill as 'un abilità tecnica stupefacente'. 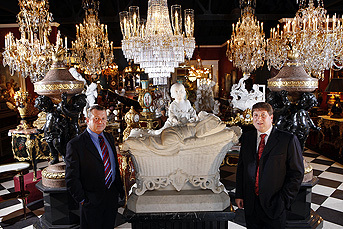 The present amazing marble group epitomises Tantardini's exceptional talents as a carver. 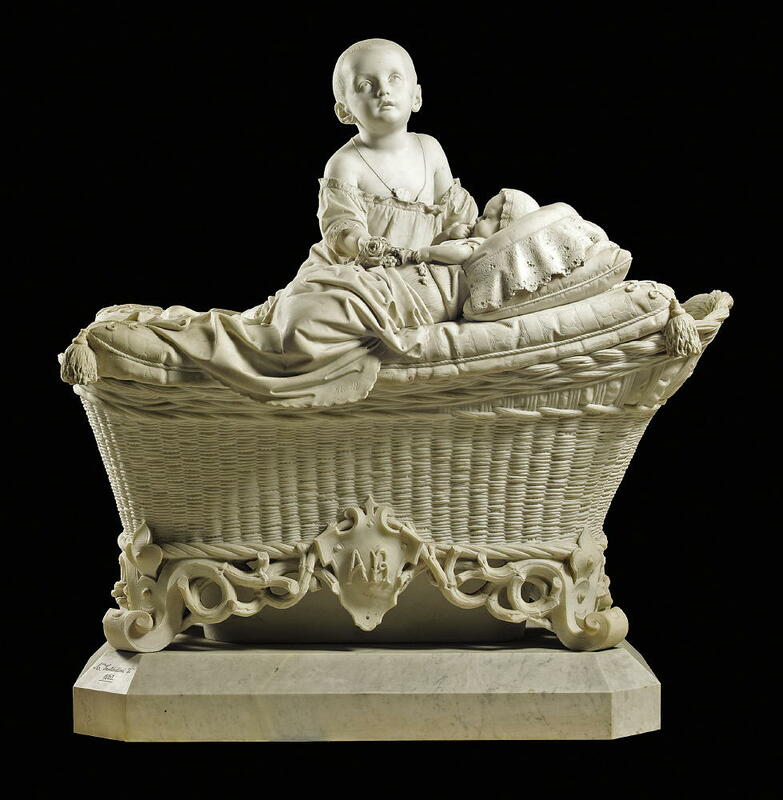 Lesser sculptors might have shied away from attempting to carve a life-size wicker crib in marble, but Tantardini has clearly relished the challenge. The result is a stunning achievement of verismo Italian sculpture. This marble group, however, is more than a paradigm of Italian marble carving, it is also a prime example of the use of Risorgimento allegory in Italian sculpture of the 1860s. 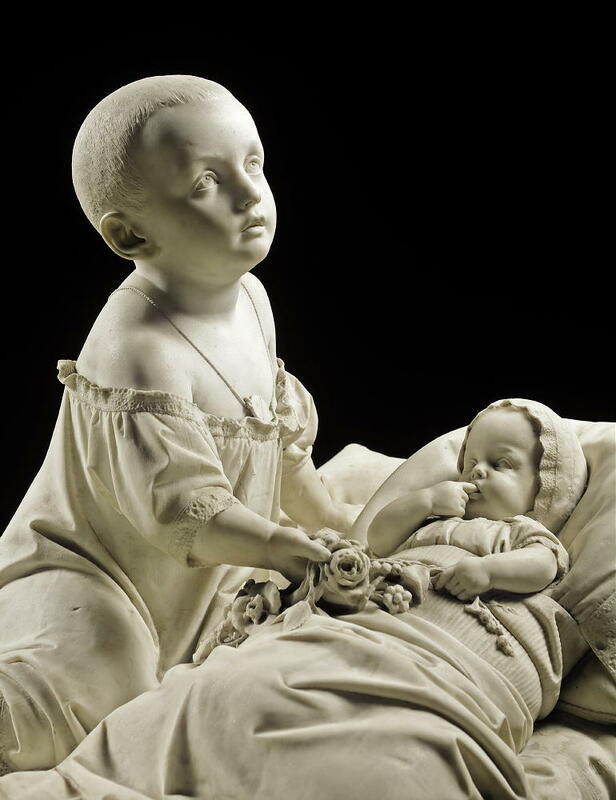 Famous sculptural Risorgimento allegories include Raffaelle Monti's Sleep of Sorrow and Dream of Joy, in the Victoria & Albert Museum and Pietro Magni's Reading Girl, sold at Sotheby's in London, 5 July 2000, lot 148 and now in the National Gallery of Art, Washington. Here the device used to indicate the underlying meaning is a discreet medallion hanging around the neck of the child, inscribed with the words Garibaldi; in the Reading Girl there is a portrait relief of Garibaldi on the medallion worn by the girl. The specific identity of the children is not known but the carved initials AR on the crib may relate to the Realini family. The two children represented in this marble group are therefore meant to represent the future of the new united Italy. By 1863 unification was almost complete, but the fledgling nation was still in conflict, with the Third Battle of Independence yet to be won. Subtle allegorical sculptures such as those by Monti, Magni and Tantardini served to endorse the legitimacy of the Risorgimento and their aspirational message is certainly more inspiring than the countless public statues of Risorgimento heroes which litter every Italian piazza; of which Tantardini too did his fair share. An Italian marble figure of a female Nymph, entitled "La Bagnanti" (Bathing woman) by Antonio Tantardini, Milan, Date 1863 was sold at Christie's King Street, London, The Opulent Eye 19th Century Furniture, Sculpture & Worls of Art Sale on 6 March 2014 for $154,475.00.